Recently named one of the BEST Female Cabaret Artists Appearing in Los Angeles by Don Grigware, BroadwayWorld.com and nominated for a BroadwayWorld Los Angeles Theater Award!!! One of Las Vegas' most critically acclaimed female trios, Lisa Smith (soprano); Margaret Menzies (mezzo); and Karen Michaels (alto), are known for their spectacular blend of powerhouse vocals and delicious harmonies. The group's popularity is also predicated on their ability to navigate through the timeless music of yesterday and an eclectic mix of Broadway, jazz, contemporary pop, rock, and even country. In short, they reinvent or “curvify” everything they sing. Each of these fair ladies bring to the group their own distinct personalities and strengths, proving that one can stay true to who they are as individuals, while working together to create something even greater. Beyond simply performing, Dangerous Curves believes in the strength of self and the beauty and empowerment of women, no matter their age, shape, size, or position in life. The trio has performed in many of Las Vegas' most renowned hotels, including The Flamingo, The Four Seasons, The Orleans, and Treasure Island. Their first CD “Girl Talk” was released in 2009 and their second CD "Star of Wonder", a Christmas album, was released in Dec 2012...both are currently available on iTunes! This is just a tiny, curvy sprinkling of what we’ve been up to! From Las Vegas, to California, to the great state of Texas, we’ve been sharing our beautiful harmonies with friends, old and new. We’ve shared the stage with talented friends and love our great home city of Las Vegas. From the National Anthem to the Dennis Bono Show, to corporate events to private parties (they flew us to Texas for the weekend!) what a fabulous time we’ve had together sharing our music, sharing our message of empowerment and love and growing as musicians and more importantly, a deepening friendship that only time and music can build. The smiles and hugs you see below are the real deal. Not sayin’ there ain’t been some tears and words! We are full of passion and emotion! But that’s the best part! Sometimes rehearsal is just that…rehearsal. And, sometimes, it’s therapy. READ ALL THE LATEST NEWS ON OUR BLOG HERE! 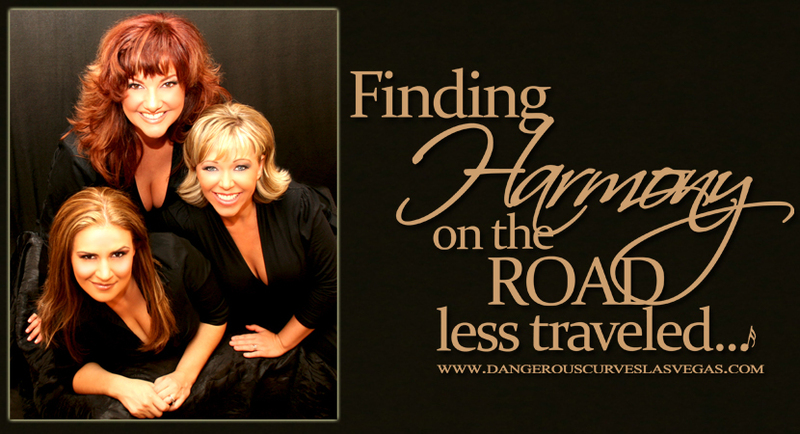 One of Las Vegas' most critically acclaimed female trios, Lisa Smith (soprano); Margaret Menzies (mezzo); and Karen Michaels (alto), are known for their spectacular blend of powerhouse vocals and delicious harmonies. The group's popularity is also predicated on their ability to reinvent or “curvify” every song they sing!